Having a baker in the family is a mixed blessing. Who doesn't love the aroma of sugar and butter circulating through the house? That's the good news: Baking equals good-house vibes. The bad news: That's a lot of calorie temptation to contend with on a regular basis. Yummy carbs are so hard to pass up. Baking is specific; it's really a science, if you think about it. Designing or modifying a kitchen for a serious baker requires some thought, even some field research. 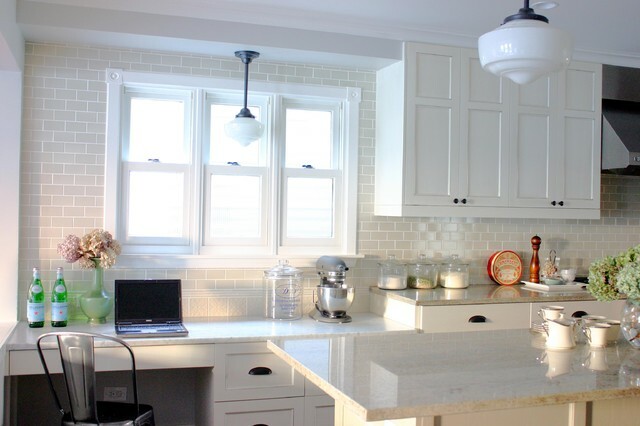 I recently put together some ideas for a baking enthusiast making some tweaks to her kitchen. 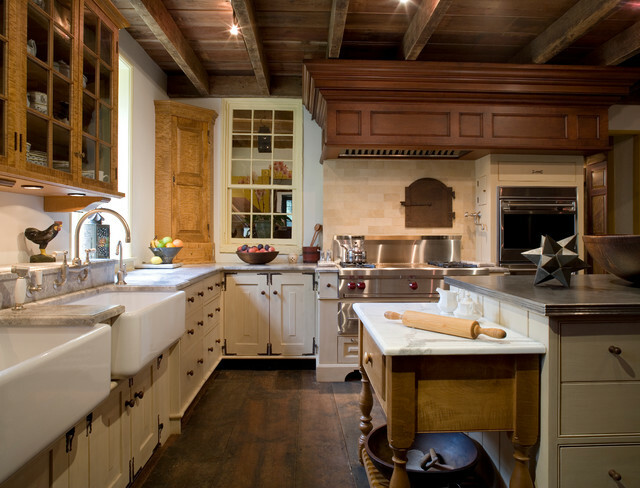 Some ideas are suitable for small kitchens, while others work best in kitchens with a larger footprint. Grab a glass of cold milk — the cookies are in the oven. Here are a baker's dozen ideas to consider while you wait. 1. Open shelves. 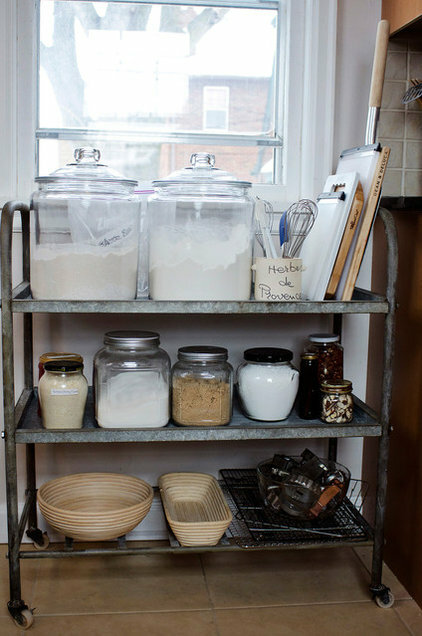 Bulk storage of dry ingredients like flour and sugar is easily accessed from convenient open shelves. 2. Rolling cart. Design with function in mind. 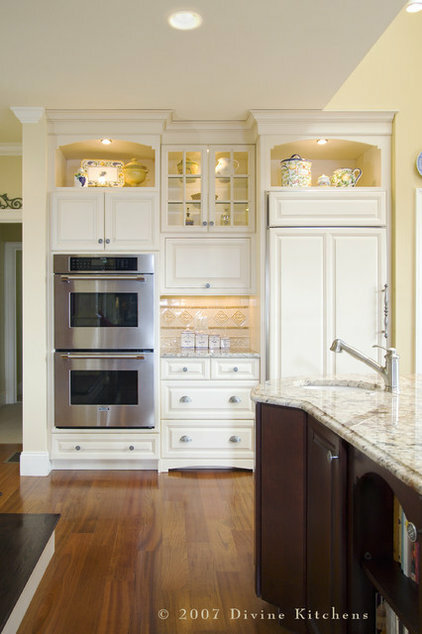 If you are short on wall space for cabinets or open shelves, consider a rolling cart placed close to counters that holds ingredients and equipment. 3. Tray and baking pan storage. Upright tray storage is ideal for bakers, because what's inside is easy to view and access; cabinets made specifically for trays are narrow and tall. 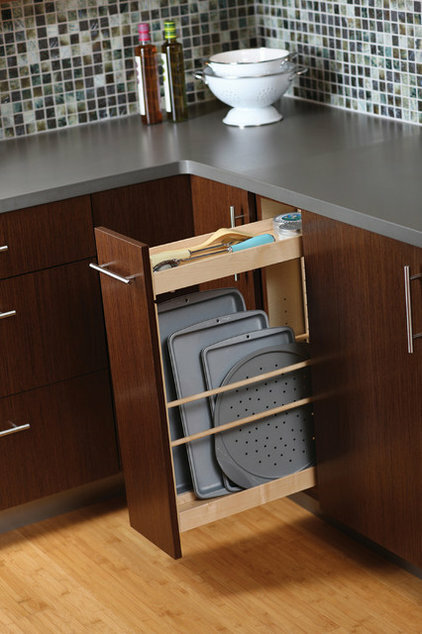 Tray storage can also be placed in upper cabinets above ovens or a microwave. 4. Storage drawers and bins. 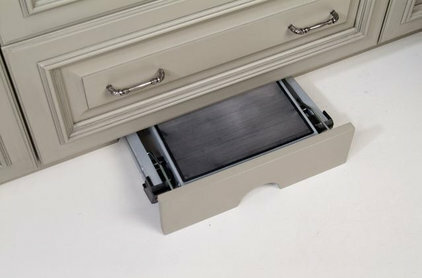 Drawers are ideal for storage. Being able to view ingredients and kitchen equipment from above is practical. Also, bins with airtight lids keep ingredients fresh. 5. Tool display. A collection of paint-dipped bread boards is hung just like an art installation here. Even if tools are just for looks, hang them out in the open. This could also work with rolling pins or cake molds. 6. Roll-out drawer. 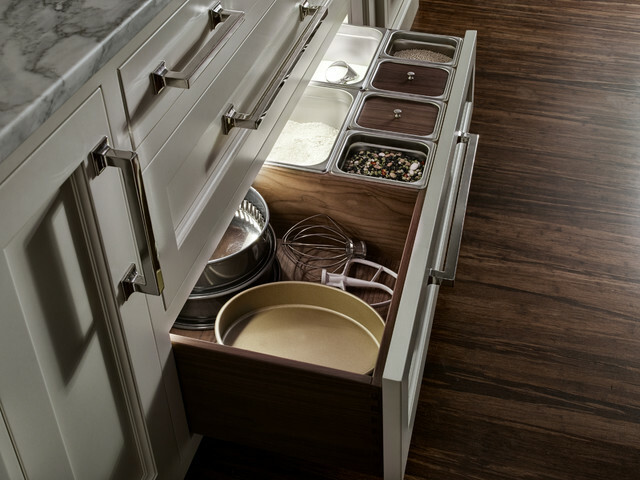 Plan for a small roll-out drawer within your cabinet design. 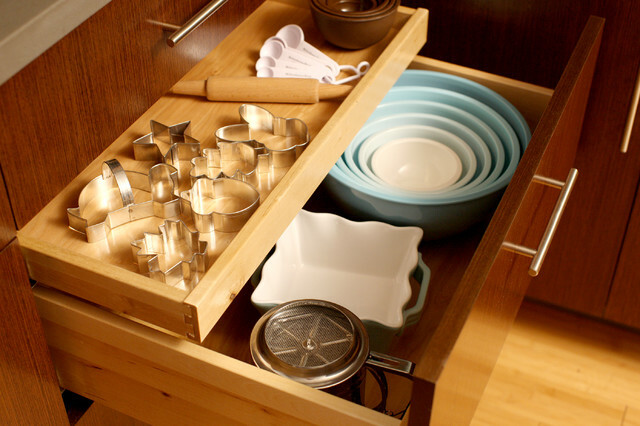 Use narrow drawers such as this for storing cookie cutters and measuring spoons. 7. Tech corner. Plan for a small space where you can wire in a TV, desktop or laptop computer or just display an iPad. There are thousands of recipes and how-to videos online. Include a tech corner next to your countertop and bake right alongside your favorite demonstration video or cooking show. 8. Double ovens. 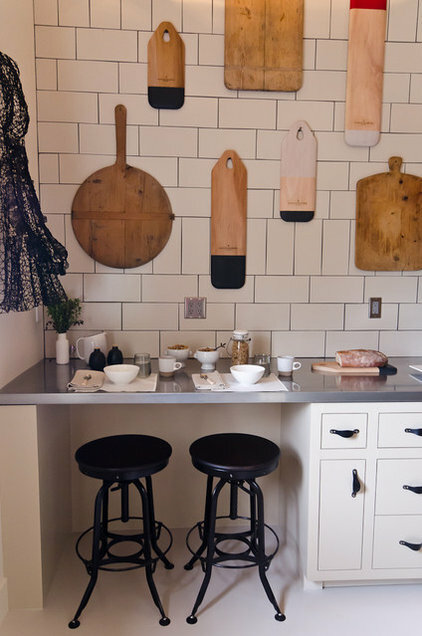 If you have the space and budget, get wall-mounted double ovens; they're dreamy for bakers. Consider looking into convection heat as well. Convection ovens work with fans that recirculate heat, which is great for evenly baked cookies and crusts. Even baked goods such as croissants develop a crispy, even texture with convection heat. 10. Workstation. 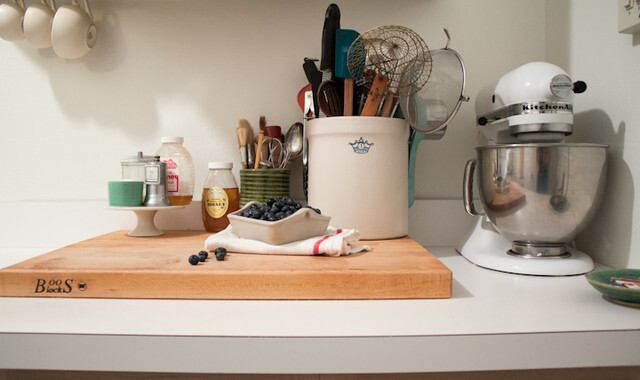 If you bake on a regular basis, go ahead: Set up a workstation right on top of the countertop. 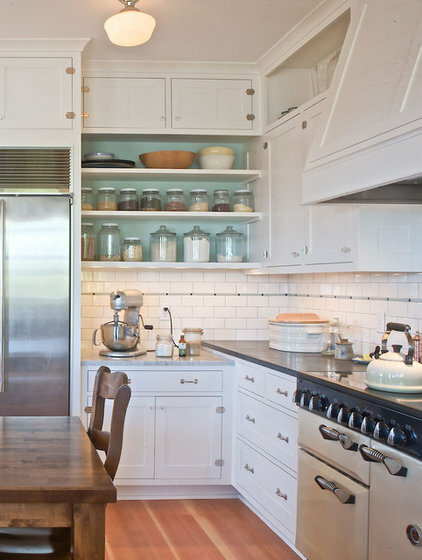 Just like in a real bakery, make the countertops your work areas. Solid-surface countertops like marble and granite are ideal for rolling out dough. Display your tools and equipment right where you use them. 11. Cookbooks. Consider a bookshelf close to a working area. 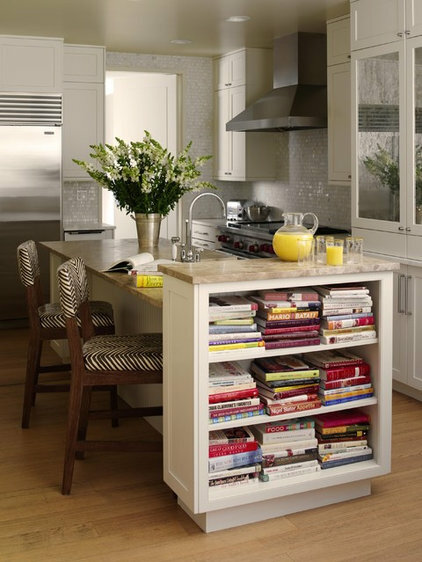 You may want to create easy access for frequently used books or recipe folders. A shelf next to a center island, for instance, is practical and good looking. 12. Spice drawer. Keep the cinnamon, nutmeg and all the rest at arm's reach. 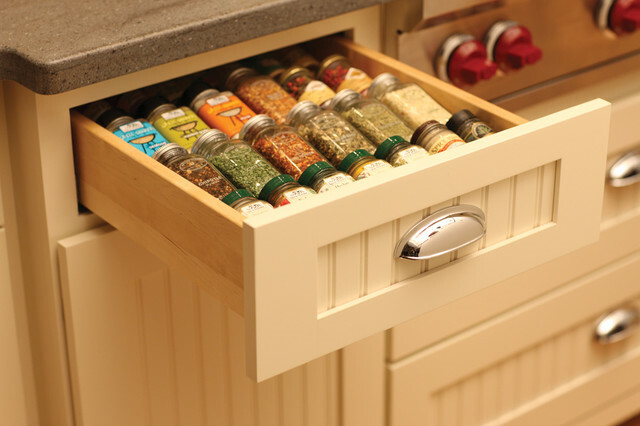 A drawer allows for a top view of frequently used spices and toppings. If you are into organization, alphabetize the spices within their rows. 13. Pastry table. Plan a space for a pastry table in the main work triangle. Old-fashioned pastry tables are typically lower than standard countertops. A marble or similar solid surface is ideal for rolling out pastry or bread dough.